The family Equidae(Equus means horse in latin) is said to have arisen some time during the Eocene epoch.They were rather small scampering animals then, almost the size of dogs, and scared ones at that. Over time as the more adaptable artiodactyla pushed this order from the perch of the dominant herbivores, they evolved into running creatures that got rid of all the other toes and use only the nail of the third toe to walk around. 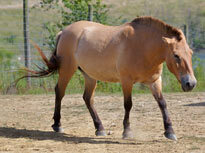 Horses are said to have evolved in the the Americas and then migrated over the bering land bridge into Asia. Over time the American horses went extinct and one part of the horse tree in Asia evolved into the horses that we know today. These animals are built for speed and their long legs are able to keep them moving at a fast canter from predators. Their stomachs are also adapted to digesting their food quickly to keep energy levels high. 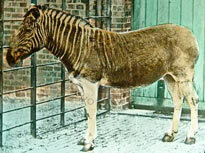 Many of the equids have a thick skull, stocky bodies, and a mane or thick hair along the length of the spine. Horses are found everywhere since domestication has made them rather ubiquitous. Zebras are found the savannah of Africa and Przewalski's horses are being slowly re-introduced to the their native habitats of mongolia and Central Asia. 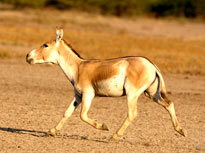 Among wild equids pregnancies last between 11 to 13 months and the the young are weaned in two months. One the savannah, it pays to be careful so most of the zebra babies are able to keep up with their mothers within a few days of birth. All equids eat grass or some sort of vegetation. Their dental structure is such that they can chew very tough grass and vegetation. They have one stomach which is able to quickly process that food(it doesn't smell nice, of course). © Mammalsrus.com 2017.All rights reserved.